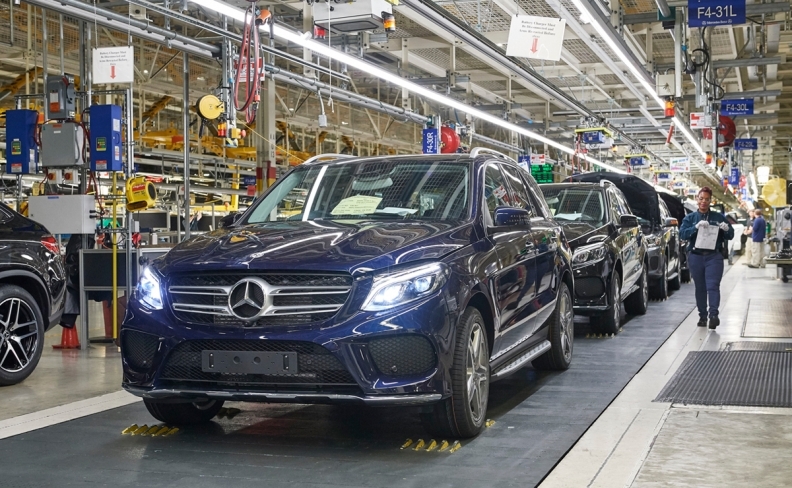 Daimler's U.S. plant builds the Mercedes GLE, formerly called the M class, along with the GLE Coupe, the GLS and the C-class sedan. TUSCALOOSA, Alabama -- Daimler said it will invest an additional $1 billion in its U.S. factory here, expanding the 20-year-old site to build full-electric SUVs for its EQ subbrand along, with their battery packs. The expansion is part of Daimler's strategic plan to electrify its entire range of Mercedes-Benz light vehicles by 2022, offering customers at least one electrified alternative in each segment to bring its total to more than 50 electrified vehicles. It also takes place as German automakers have been the target of criticism from President Donald Trump over what he has said are unfair trade practices, singling out the success of Mercedes and rival BMW in the U.S. market as evidence. "With production locations for EVs and batteries in Europe, China and now the U.S., our global network is ready for the era of electric vehicles," said Markus Schaefer, member of the divisional board of Mercedes-Benz Cars responsible for production and supply chain. "Thanks to our plant modernization in Tuscaloosa, we will be able to quickly ramp up U.S. production of EQ models." Daimler showed off an EQ concept SUV last year at the Paris auto show. It was described as a "near-production" vehicle. The EQ line eventually will consist of cars, crossovers and SUVs. Construction work on the plant is expected to begin in 2018, with production of EQ vehicles slated to start at the beginning of the next decade. At the time of launch, these models will also feature the latest in autonomous driving technology, according to Daimler. A battery pack plant, the company's fifth, will be located in a separate facility nearby. "With production locations for EVs and batteries in Europe, China and now the U.S., our global network is ready for the era of electric vehicles," Schaefer said. Final details of the plans are still being worked on in partnership with the Alabama government, but it is expected that the investments will create more than 600 jobs. Daimler did not quantify the capacity of the battery plant, nor the expected output of the vehicle plant after the latest $1 billion investment. The U.S. plant builds the Mercedes GLE off-roader, formerly called the M class, along with the GLE Coupe crossover, the larger GLS SUV and the C-class sedan. Output at the plant, in which Daimler has already invested over $5 billion to date, surpassed 310,000 vehicles last year. The latest additional $1 billion investment comes close on the heels of a decision in September 2015 to pour $1.3 billion into the Alabama site, including a new body shop. This would allow the operation to build the next generation of Mercedes SUVs. "Looking back on 20 years of production, the Mercedes-Benz plant in Tuscaloosa has been a success story from the beginning. We are now continuing this story with a clear vision for the era of electric mobility," said Jason Hoff, CEO of Mercedes-Benz U.S. International. Until now, Daimler had only confirmed EV production at its three German factories in Rastatt, Bremen and Sindelfingen but it said in May that it would build vehicles for its EQ subbrand throughout its global network, depending on local demand.